Simple, effective and very sensibly priced, Buffalo’s Nucleus Overboots and Overgloves help keep hands and feet warm and dry when the weather turns sour. Easily stashed in luggage or under the seat, they can be pulled on quickly and easily to keep the rain and wind at bay – ideal for riders who prefer the feel and control of summer or mid-season riding boots and gloves, and as an extra defence against the cold and wet for exposed hands and feet. Overboots and gloves are also popular with scooter riders, who may not feel the need to wear heavy duty motorcycle gear, but still require protection from the elements. Both boots and gloves are made from water- and wind-proof PU-backed polyester, which keeps out the rain and acts a barrier against wind, too. The gloves feature a rubber section to the palm for grip, with an elasticated wrist and pull-cord cuff to help seal out the weather. The boots have a partially-treaded rubber sole, popper and Velcro® closure and an elasticated upper calf, plus reflective detailing for increased visibility. 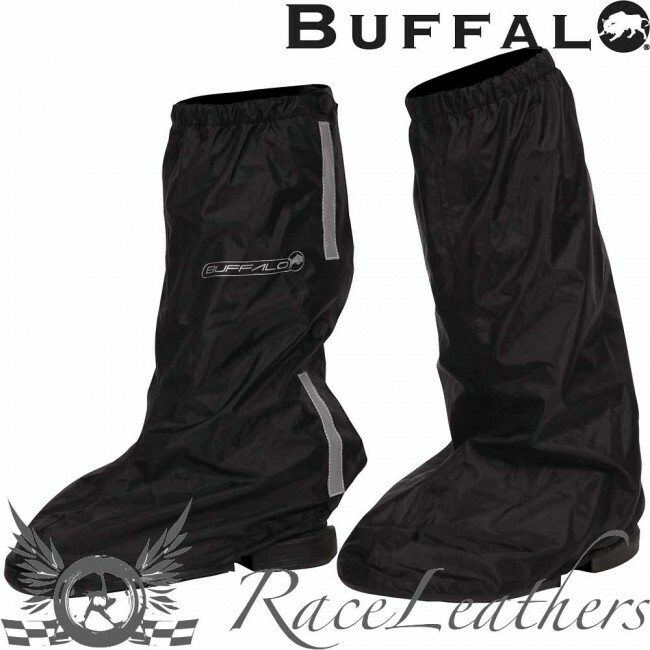 Buffalo Nucleus Overgloves come in sizes S/M – L/XL; the matching Overboots come in sizes S-XL. A tried and tested alternative to more expensive ‘high-tech’ winter riding kit, these motorcycling staples will help to keep riders warm and dry throughout the cold and rainy months without busting the budget.